In this project, we aim to elucidate the behavior of micorbial communities and of the individual microbes within these communities, establish the molecular foundation to control them, proceeding with advanced technology development, utilization and integration such as COCRM enabling to observe microbes with non-destructive, non-invasive, non-transgenic and stain-free method, microfluidic device techniques for sequential observation under microscope and manipulations. These techniques and experiences of the research and development are expected to be applied in other related fields. Let's check out the following techniques and devices supporting our research. We built this micro TAS chip to image complex microbial biofilms in activate sludge.It simaltaneously enabled sequential measurement of the ammonia removal rate by the complex microbal biofilm. This made it possible to analyze using a few tens of μL to study biofilm behavior and its ammonia degradative ability simaltaneously. These techniques are highly useful when clarifying microbial behavior and applying the results to other fields. 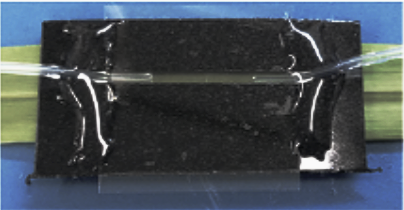 We herein introduce a flow channel device named the Stickable Flow Device, which is easily configurable and deployable on various surfaces for the microscopic imaging of environmental microbes. We demonstrated the utility of this device by creating a flow channel on different types of surfaces including live leaves. This device enables the real-time imaging of bacterial biofilms and their substrata. The Stickable Flow Device expands the limits of conventional real-time imaging systems, thereby contributing to a deeper understanding of microbe-surface interactions on various surfaces. A Versatile and Rapidly Deployable Device to Enable Spatiotemporal Observations of the Sessile Microbes and Environmental Surfaces. Kiyokawa T, Usuba R, Obana N, Yokokawa M, Toyofuku M, Suzuki H, Nomura N.
Microbes Environ., 2017 Mar 31;32(1):88-91. Light-microscopy (-250nm) based Super-resolution imaging system. Invention of PALM (Photo-Activated Localization micriscopy) was awarded the Nobel Prize in Chemistry 2014, and can acheive 20 nm resolution. PALM recognize molecular localization by randomly exciting fluorescent molecules thereby achieves super-resolution. The system is capable of 3D(X/Y/Z) PALM imaging. The LSM710 is invented, a confocal laser scanning microscope that enables observation of cultured cells and cells in a multiwell plate. The system utilizes 32-channel high-sensitivity GaAsP detector, low lebel laser irradiation and a spectrum imaging range from 400 nm – 800 nm, which makes it possible to observe a maximum 10 fluorescent dyes concurrently during long time lapse acquisition. Combined with Airyscan, this system can achieve 140 nm super-resolution confocal image acquisition enabling us to resolve the biofilm structure in greate detail. The LSM880 NLO, conforcal laser scanning microscope is an upright microscope that utilizes an infrared femtosecond pulse laser, which will enable us to analize the 3D biofilm structure clearly, even at great depths into the biofilm where light scarcely reaches. Combined with Airyscan detector,we will achieve super-resolution in confocal microscopy, enabling analysis of 4D super structure deep within the biofilm. Data will be collected with a 32-channel high-sensitivity GaAsP detector. PALM MicroBeam enables the retrieval of the singlecells, completely contamination-free with a target area. This system is built on an inverted microscope and can be applied to various types of slides and dishes, in addition to common microscope slides and glass bottom dishes. Furthermore, precise extraction of desired regions is possible on the micro -as well as macro-scale. In the case of living cells, after retrieval, it is possible to culture them without damaging their activity. The Axio Zoom.V16 acheives ultra high zoom by adopting a new mono-zoom optical system. The system has high numerical apeture (NA 0.25) at 1x magnification. In the medium zoom range it has a very high apeture, enabling acquisition of clear and bright images over wide areas. Multidimensional Fluorescent imaging is also possible. Copyright © 2016 JST-ERATO NOMURA Microbial Community Control Project. All Rights Reserved.